[SG] Tan's 'Tu Tu Kuih'. 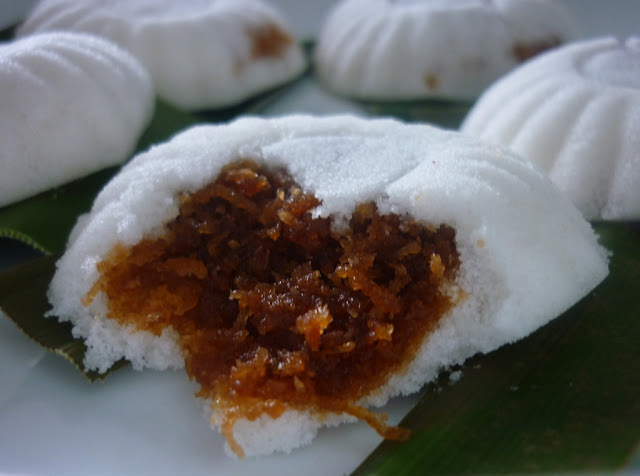 Kuih tutu is made by steaming rice flour in a special mould. First the mould is filled with finely pounded flour. Then a portion of the filling is taken out to make space for the filling. This could be grated coconut or ground peanuts or a combination of both. The grated coconut would have been fried on low heat over several hours and sweetened with gula Melaka (palm sugar). Another layer of rice flour is added to seal the filling and the cake tipped over onto a muslin cloth placed on the steamer. The cakes take on the flower-like shape of the mould. Placed on a cut pandanus leaf before serving, they acquire a sweet flavour and scent. The flour is slightly sweetened so the cakes tastes just as good even without filling and are sometimes sold thus. (+) Both the peanuts and coconut fillings are prepared to perfection, not overly sweet. (+) The fresh coconut ingredient being used is 'makan-friendly' for those with sensitive stomach. (+) Thin layer of flour and generous serving of filling. (-) Possibly due to the waiting time before consumption, the surface of the kueh was slightly hardened. [SG] Kaya toasts of Singapore.